Along with her presence in From Pemberley to Milton, Mrs. Kincaid also decided to present our readers with 2 e-books: one of How Mary Met the Colonel and another one of Darcy vs. Elizabeth. I hope the interview will entice you to read these books and help you select the one you would prefer to win in the giveaway. Thank you so much for coming to FPTM Mrs. Kincaid. This is a recurring question, but I always like to know this about authors. Why and when did you decide to write Jan Austen Fan Fiction? What attracts you the most in JAFF? Like many JAFF authors, I started by reading—and loving—JAFF. I was so thrilled when I discovered this world. I had always wished there was more Jane Austen to read—and now there was! And, even better, a whole universe of (really nice) people to share it with. I hadn’t written a lot of novels, although I’d been a playwright for many years; but after reading JAFF for a while, I started getting my own Pride and Prejudice story ideas that simply would not leave me alone. 🙂 I finally wrote one down — and was surprised and thrilled at the reception it got from readers. You have recently released a novel called When Mary Met the Colonel. Of all the secondary characters in Pride and Prejudice why did you choose Mary as main character for your novel? Like a lot of readers, I really empathize with Mary—since we’re both bookish introverts. But she’s not very interesting when portrayed as moralizing and pedantic. I thought maybe because she’s so quiet there were sides to her that no one had noticed, and I wanted to explore those other dimensions. In this novel we see a different side of Mary that no else ever bothered to see. How did you create this character, what inspired you to make her the perfect bride for Col. Fitzwilliam? When I thought about uncovering new sides of Mary, I considered who might bring those qualities to light. I thought Colonel Fitzwilliam was perfect, in part because he’s not the obvious choice; he’s her opposite in many ways. Because he’s friendly and extroverted (and a soldier), he discovers—and helps the reader see—sides of Mary we haven’t seen before. They also seem like two of the lonelier characters in P&P, so it was fun to bring them together. You are now releasing a new novel, what can you tell us about it? It’s called Darcy vs. Bennet and is sort of Romeo and Juliet combined with P&P. The premise is that Elizabeth’s father and Darcy’s father had a falling out in their youth and the two families have been feuding ever since. Darcy and Elizabeth meet and fall in love, but their families—particularly Darcy’s father (who is alive in this version)—stand in the way of their marriage. It’s not very common to see Darcy’s father alive in a variation, how is he like? And how does this affect Darcy’s personality? It’s very interesting what happens when Darcy’s father is alive. We’re so used to Darcy being his own master and not having to answer to anyone. However, in this book his father is not only alive, but he controls the purse strings. So that adds additional consequences to Darcy’s actions. His father also hates the Bennets, creating more obstacles for our heroes. What about Georgiana? With her father alive I’m guessing the incident in Ramsgate must have been different, is she very present in Darcy vs Bennet? And is she still the shy sweet girl we know her to be? Georgiana appears in the beginning—on the verge of a Ramsgate-like mistake—and then again later in the book. But her personality is basically the same; she’s very supportive of Darcy in his struggles with their father. This is the second novel you will release in a very short time, can we expect you to become a full time writer? I wish! It is a goal I’m working toward, but not there yet. When Mary Met the Colonel was actually written in 2015, but I didn’t publish it until 2016 because my family moved in November and I was overwhelmed with my day job. But Darcy vs. Bennet was written mostly in 2016 and it’s March, so I’m pleased with how fast it went. I’m finishing up the first draft of my next P&P variation, but there will be at least two more drafts. Still I’m hoping readers won’t have to wait too long for that one. If I sell enough books this year I might consider going full time. My husband has been very supportive. You mentioned your day job could be overwhelming, how do you combine a full time job with writing? It doesn’t seem easy to combine everything you’re doing, plus, you are a self-published author. Could you tell us which are the main obstacles self-published authors face? And what is more rewarding about it? There are so many obstacles it’s hard to pick just one. 🙂 There are internal obstacles like getting yourself to write every day and meeting deadlines. Then there are more external obstacles like figuring out how to market your writing in an industry that’s constantly changing and building up a readership. But I really enjoy writing. I love every part of it: writing the first draft, doing revisions, and getting that sense of accomplishment when I finish a book. However, I would say that the reactions from my readers are even more rewarding. It’s great when hundreds of people buy my books, but it’s particularly wonderful I hear from someone on Facebook or email about how much my work means to them—and how they re-read my stories. There are authors whose books have had that impact on me, and I’m honored and humbled that some of my readers see my writing that way. Writing can be grueling, and sometimes it’s the readers who keep me going. I know there are people waiting for my next book, so I want to get it to them and I want it to be good. As I mentioned before, Victoria Kincaid was kind enough to bring 2 e-books to giveaway at From Pemberley to Milton. The giveaway is international, and to participate all you have to do is leave a comment on this post. Let us know which of her books you would prefer to win and why, or just ask her your own questions. 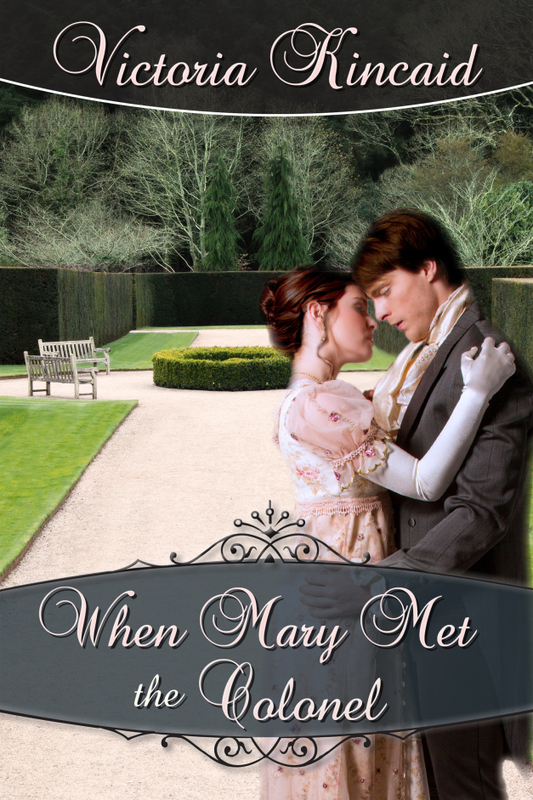 To increase your chances of winning, you may comment on the review for How Mary Met the Colonel or the excerpt for Darcy and Elizabeth we will be posting in the end of this week. The giveaway is open until the 11th of April and the lucky winners will be randomly picked, and contacted a few days later. I enjoyed reading Mr. Darcy to the Rescue, and look forward to reading When Mary met the Colonel and Darcy vs Bennet. Both sound like great stories. Thanks for sharing! Hi Maureen, I’m so glad you liked MDttR! It always makes me happy to hear that. Good luck with the giveaways! Hi Vesper, I’m so glad you’ve enjoyed my other books. Good luck! I really liked When Mary Met The Colonel and Mr Darcy to The Rescue. I am waiting to buy D Vs B because the paperback isn’t available yet. Thank you for writing such great variations. Hi, I’m so happy to know you liked my other books! The paperback for D vs. B just became available. I hope you enjoy it. D vs E sounds like a book I’d enjoy reading. Thanks for the lovely interview and the giveaway opportunity! Hi Priscilla, I hope you do enjoy it. Thank you for you interest and good luck! Bennet is a few steps higher, though! Thank you for the insight into these stories from the author’s perspective. Hi Debbie, I’m glad you find a combo of P&P and R&J intriguing. And I’m so happy you enjoyed my other books. Good luck with the giveaway! Hi Glynis, Sometimes I don’t know how I find the time either! 🙂 Thank you for your interest! Hi Claudine, Thank you for your support! I’m so glad you enjoyed the books. You’re welcome! You have a big fan in me, so I thank your husband for supporting your writing efforts. I am glad the efforts on your new story are going well! Pride and proposals was probably one of my favourite books by Victoria. However ‘How Mary met the Colonel’ sound quite good. Poor Col,Fitz-he’s always there with Darcy,gently persuading him that yes,Elizabeth is a woman worth wooing ,while occasionally,,having s soft spot for her himself!! Oh! The plight of second sons!! So giving him a chance to stand in the spotlight seems like a nice change and putting him with Mary who is often do overlooked,is,to my mind, quite charming. Looking forward to reading this one! Hi Mary, I felt that way about both Mary and the Colonel — they’re often “also rans.” So it was fun giving them their own story. Good luck with the giveaway! Hi Patricia, Thank you for your interest and good luck with the giveaway! Wonderful interview. It is always fun to learn more about the authors we love to read. I have had fun reading Mr. Darcy to the rescue and pride and proposals and the secrets of Darcy and Elizabeth . Thank you for the giveaway . I always learn something new from interviews. It’s fun to get background on book and author. I read and loved When Mary Met the Colonel. Mary was definitely a deeper person and most likable as was the Colonel. I was most intrigued by what it was like to be an indie author combined with a day job. Insightful there. And because I enjoyed WMMtC, I’m going to put my name in for the possibility of winning Darcy vs. Bennet which whew, sounds exciting. Thanks for the opportunity! I wish I could meet her this weekend in Bethesda, but I have to go to my son’s LAX game. I would choose Darcy vs. Bennet, but When Mary Met the Colonel sounds like a great read as well! I loved reading When Mary Met the Colonel and the instant attraction. They are two people often overlooked and it was beautifully written. I’m now looking forward to getting Darcy vs Bennet, and if I were lucky enough to win a copy that would be amazing; thanks for the opportunity. I’m pleased to read that your next book in already in its first draft form – that’s so brilliant – thank you! I just bought the ebook of Darcy vs Bennet yesterday and read it til I finished it. It was a great read that I couldn’t put down. Congratulations on a job well done. I will write my review today on Amazon. However, I didn’t get a chance to read When Mary Met the Colonel. I love reading about the Colonel as he is one of my favorite characters, however, I always have a soft spot in my heart for Mary. So this would be a great read for me. Thank you for letting us into your life and letting us have a chance to enter! Great interview! I’ve really enjoyed Victoria’s books. “Darcy vs. Bennet” seems like an awesome premise. 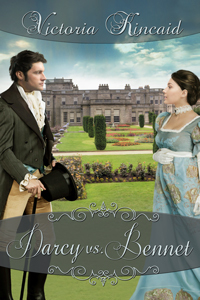 After enjoying Mary’s story, I’ve immediatly put Darcy vs Bennet on my wishlist so I would love to read it! Can’t wait to read both of your newest novels! Loved your other stories! I would love to read Darcy vs. Elizabeth! Oh, yum! This sounds like absolute delish! Thanks for the great post, lovely ladies, and thanks, Victoria, for another wonderful book! I have enjoyed reading all of Victoria Kincaid’s books thus far and am looking forward to reading her newest releases. They sound intriguing. This book sounds really interesting. I really would like to read Darcy vs Bennet, I am curious about Darcy’s father,though, I do not like he opposed Darcy and Elizabeth. However, I cannot wait to read this book. Very interesting premise! Already on my wish list, but I’d certainly love to win a copy! Thanks for the opportunity! I’m really intrigued by “How Mary Met the Colonel”. The premise sounds amazing!